The Fishorian features recreational fishing articles, pictures (and later, videos! ), initially within Malaysia. But earnest plans are afoot to eventually cover surrounding waters in Thailand, Singapore and Indonesia. Eventually... who knows? We may even do something on fishing in Australia's famed Northern Territory or Florida Keys in the States! 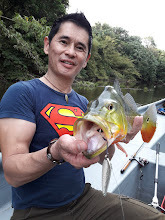 Our angling journalist behind the rod is Trevor Tau Fik, currently a feature writer with Rod & Line, Malaysia's sole English language angling magazine. Some may also know him as Rod Ranger from the "Paypond Patrol" series in the same publication, although that section has gone into apparent hibernation at this time, due mainly to the sorry state of affairs at most payponds these days. However, we understand that a revival would be immediate should he come across a fishable paypond to feature. So if you know of one, drop us a line and we'll bite. In fact, that applies also to any place you fancy, not just payponds. Even if it is for no other reason apart from lying about the size of the fish you caught (or didn't), we'd be happy to hear from you. In the meantime, please watch this space and accord us the same patience that you devote to the fish 'coz we'll need some time to grapple with stuff like learning how to post photos, creating an exciting layout and such... Heck, we're only good at fishing! Our first posting (Beautiful Bukit Beruntung Part I) will splash in on April 1st, 2008... and we're not fooling!